TALON5's speed regulation system features a passive variable pitch control mechanism which provides a reliable and productive solution for the small wind system. Since the variable pitch mechanism allows a wider working range than the other designs, TALON5 can produce more energy than the competitive turbines using other speed regulation methods. This also means that you will recover your investment in a shorter period of time. Look at pictures of our latest Talon5 installation HERE. Powerful: Direct drive PMG with rare earth magnets and improved coil design. 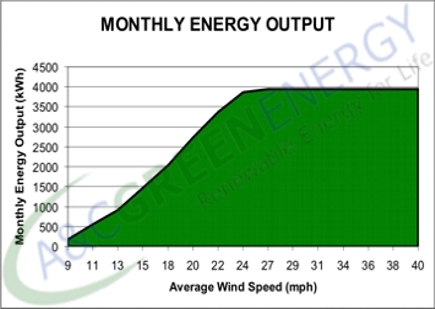 Rated wind speed is only 24.6 mph, which is much more efficient than the popular products with a higher wind speed and a low rated power. 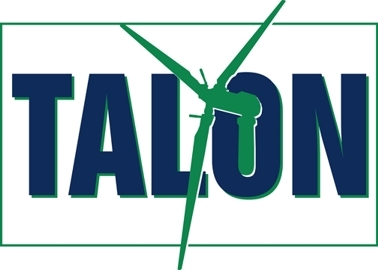 Because of the variable pitch technology, TALON's work range is much wider and can work up to 56 mph, however the competitive products will shutdown at high wind when it's time to harvest wind power. Reliable Speed Regulation: Dual speed regulation mechanisms are adopted. The variable pitch technology confines the RPM to below 280 RPM and the electromagnetic brake will kick in when the RPM is over 320 RPM. These two technologies combined to securely keep the system from over speeding. Manual or Auto Shutdown: Manual winch is provided to shutdown the system smoothly. As an option, an automated system is available to shutdown the system at a preset triggering condition. Auto shutdown will be trigged at 360 RPM. Superior and Reliable Electronics: Top brand and UL certified electronics for grid-tie approval. The CE certified E-Load box is designed and tested in the toughest conditions and will never fail. The UL 1741/IEEE1541 listed inverters are accepted by most of utility providers for grid-tie operation. High Efficient: 90% generator efficiency and 0.4 blade co-efficiency. Low Noise: <= 65 db. High Survival Wind Speed:The reinforced fiberglass blades can endure 2 times of nominal rpm. It can survive 111.8 mph wind speed when still. 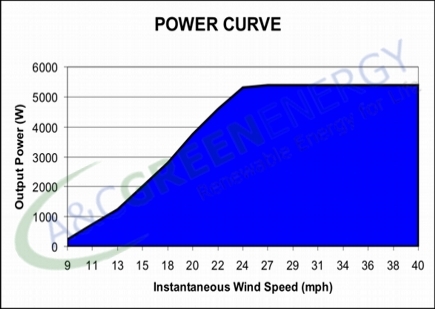 Variable Pitch Technology: The only downwind variable pitch wind generator at 5KW available on the market. GENERATOR - 5KW PMG built with neodymium magnets, 3 phases AC output. The housing is precision-cast steel and has been hot-dipped galvanized for anti-corrosion protection. It is built to withstand severe climates, sand and salt corrosion. 3 FIBERGLASS REINFORCED BLADES - mirror finished with UV coating, balanced with hub. High efficient design, whisper quiet and vibration-free. E-Load Box - Power box converts AC 3 phases to DC current. CE listed. INVERTER: UL 1741/IEEE1547 listed grid-tie. POLE - 40 foot mono tower. Other tower size available.